Chelan is a small, yet well spread out, city in Chelan County, Washington, with 4,000 residents. It sits on the southern shore of Lake Chelan where it meets the Columbia River. Along with its neighbor, the community of Manson, it is the only city in this section of eastern Chelan County. 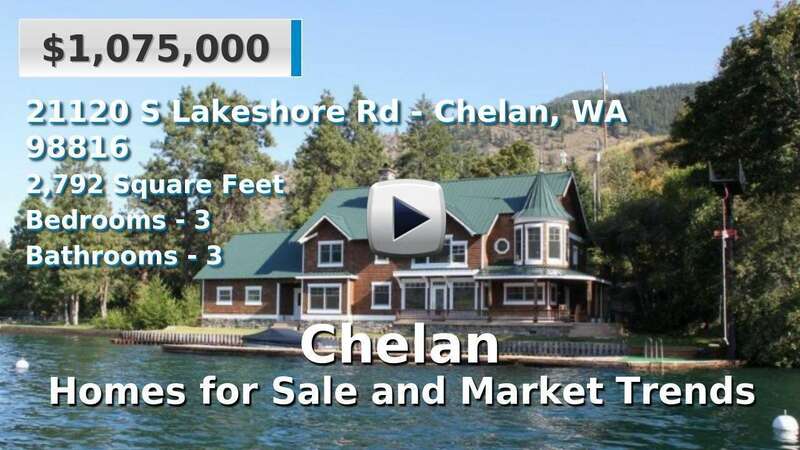 Chelan is a home buyer's dream, equally as flush with condominiums, single-family residences and new constructed homes for sale. Chelan has a little bit of everything, in terms of nature: mountains, dense forest for camping, hiking, and winter sports, lakes for fishing and water sports, and vineyards. Residents love to stay active and enjoy their diverse scenery. 3 Beds | 3 Baths | 2127 sq. Ft.
4 Beds | 4.25 Baths | 5000 sq. Ft.
3 Beds | 2 Baths | 2658 sq. Ft.
2 Beds | 1.5 Baths | 1784 sq. Ft.
3 Beds | 2 Baths | 2034 sq. Ft.
3 Beds | 3 Baths | 2336 sq. Ft.